Few people realize that the first character in the Bible (after the headline sentence of Genesis 1.1) is Earth. What if we read the creation story and the primal myths of Genesis from the perspective of that key character, rather than from the anthropocentric perspective in which our culture has nurtured us? This is the project of Norman Habel’s commentary, resisting the long history in Western culture of devaluing, exploiting, oppressing and endangering the Earth. Earth in Genesis first appears wrapped in the primal waters, like an embryo waiting to be born. On the third day of creation it is actually born and comes into existence with its green vegetation as a habitat for life of all kinds. It is hardly a moment before Earth is damaged by human sin and suffers a divine curse, and then must cry out for justice for the blood of Abel it has been compelled to drink. It is an even greater curse when Earth, together with almost all life on Earth, comes near to total annihilation at the Flood. Has Earth brought this fate upon itself, or is it the innocent victim of human wrongdoing? Genesis has God regretting the threat to Earth and its children that the Flood has brought, and vowing to green Earth again, remove the curse, restore the seasons and make a personal covenant of assurance with Earth and its creatures. 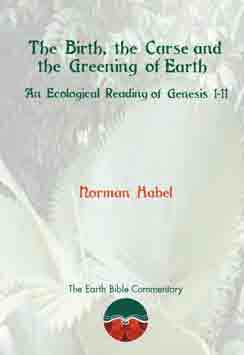 The ecological approach of this commentary was first developed in the five-volume multi-authored series, The Earth Bible (2000–2002). In The Earth Bible Commentary, of which this is the first volume, a group of scholars dedicated to the re-valuing of Earth pursue these themes in their commentaries on the books of the Bible. Other volumes in preparation are: Deuteronomy, Ruth, Job, Psalms Book 2, Ecclesiastes, Isaiah 1–39, Joel, Matthew, Luke, Colossians, Revelation. Norman Habel is Professorial Fellow, Flinders University, Adelaide, South Australia.